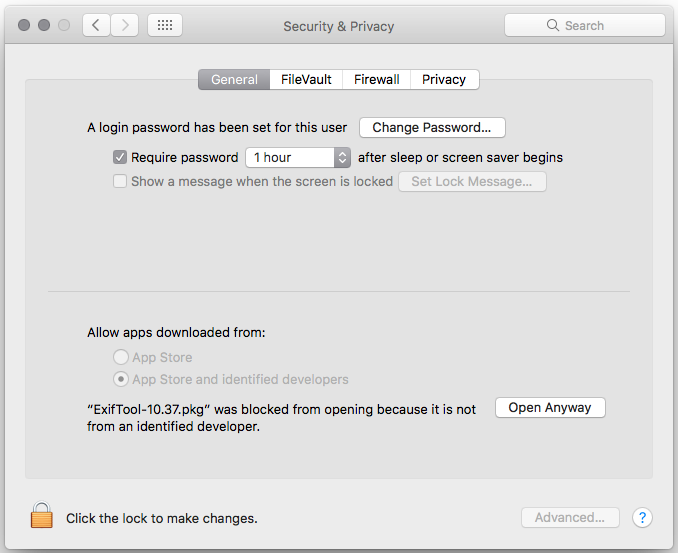 In macOS Sierra, the security around apps from unidentified developers has really been tightened. 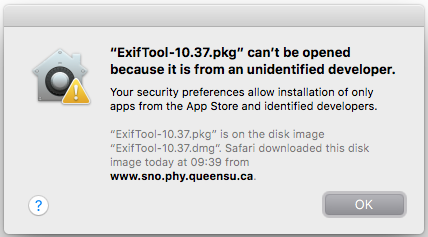 In previous releases of the OS you were given an option to open the app if it came from an unidentified developer but it seems that Sierra just gives you the 'OK' option and will not launch the app. There is a way around it however so read on for how to do it. "ExifTool-10.37.pkg" can't be opened because it is from an unidentified developer. Your security preferences allow installation of only apps from the Apps Store and identified developers. However when looking at the Security & Privacy settings, there is no option for 'unidentified developers' any more! What you do see however is a button 'Open Anyway' for the specific app you've just tried to launch. So to open the app you want, you actually have to try and open it first, then go to the Security & Privacy settings and click the 'Open Anyway' button and then open the app again. After opening the app for a second time, you are then warned that it is from an unidentified developer again, but this time you are given the option to open it. Clicking 'Open' will now finally launch the app.